This sedan comes with the revolutionary Fluidic body design that makes it look unique in comparison to other sedans. To begin with its front profile, it comes with a sleekly crafted headlight cluster that is complimented by the expressive lines on the bonnet. The radiator grille comes with a hexagonal design with a chrome plated strip along with the company logo, which amplifies the premium look of its front profile. The bumper comes with a body paint and also has a pair of built in fog lamps, which further adds to the style. The side profile of this premium sedan will certainly steal your attention, thanks to its lustrous body structure with expressive lines. The wheel arches of this sedan have been fitted with 16-inch diamond cut alloy wheels , which further enhance the urbane look of its side profile. The external rear view mirrors along with the door handles have been painted with body color, while the side moldings are in black. Coming to the rear profile, this sedan comes with a very stylish boot lid with fluidic structure that dominates the entire profile. The taillight cluster has a very sleek design and it is equipped with high intensity tail lamps and turn indicator. This latest entrant, Hyundai Verna Fluidic 1.4 CX diesel trim comes with an elegantly crafted interior design with a plush color scheme, which gives a luxurious feel to the occupants. The company has blessed the interiors of this sedan with high gloss black and woodgrain color scheme and it is complimented by Blue illumination. In addition to this, the company is also offering this sedan with a chrome package that makes the interiors look luxurious. The company has fitted well cushioned seats inside the cabin, which have been covered with premium quality fabric upholstery. This trim also gets a three spoke multi-functional steering wheel that is decorated with a unique silver garnished strip along with chrome plated company log o. Apart from these, this mid level trim also comes with numerous features such as a climate control unit, power windows, front seat back pockets, driver and passenger vanity mirror, driver information display, sunglass holder, theater dimming interior lamp , cooled glove box are just to name a few. This newly introduced diesel variant comes equipped with an advanced 1.4-litre, 4-cylinder, diesel engine with a total displacement capacity of 1396cc . The company has incorporated this engine with a Dual Overhead Camshaft valve configuration and it also has a CRDi fuel supply system. This enables the motor to produce a maximum power of 88.8bhp at 4000rpm and at the same time, it can yield a peak torque output of 219.9Nm between 1750 to 2750rpm. The company has paired this CRDi diesel engine with a 6-speed manual transmission gearbox that delivers the torque output to the front wheels. On the other hand, this engine is capable of producing a mileage of about 23.5 Kmpl, which is quite good. The latest trim is blessed with a highly efficient disc braking mechanism that ensures precise stopping. The company has fitted all the four wheels of this sedan with proficient disc brakes. In a bid to enhance this braking mechanism, the company has incorporated anti lock braking system with electronic brake force distribution system as well. On the other hand, it comes with a speed sensitive steering system that reduces the efforts of driver when maneuvering this sedan even at a low speed. Coming to the suspension system, the front axle comes fitted with McPherson Strut type of suspension, while its rear axle is assembled with coupled torsion beam axle type of mechanism. In addition to this, the company has also equipped coil springs and stabilizer bars for the front axle, which will improve its ability to absorb all the jerks caused on the road. 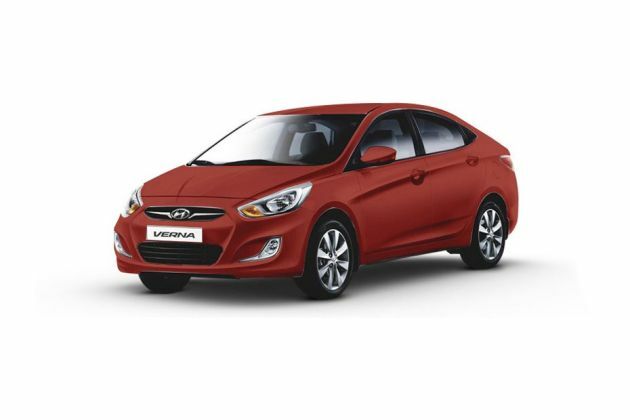 This Hyundai Verna Fluidic 1.4 CX is the mid level trim and it comes with some of the best-in-class comfort features. The manufacturer is offering this new variant with a lengthy list of features including a key less entry function incorporated to the folding key, rear parking sensor, rear view camera with display on ECM, Bluetooth phone connectivity with controls mounted on steering wheel, an automatic AC unit with climate control system along with clean air function, electrically adjustable and foldable outside rear view mirrors, an electro chromic IRVM and lots of others. Apart from these, the company is also offering this new trim with front seat back pocket, electric power steering system with tilt function , height adjustable front seat belts, theater dimming interior lamp, and other important features. The company is offering this newly introduced trim with an array of safety features that provides good protection to the occupants inside. The list includes driver airbag, ABS with EBD, front fog lamps, central locking system, automatic headlight control , impact sensing auto door unlock, clutch lock system and many other such features. It also comes with an advanced engine immobilizer system that keeps the vehicle protected from unauthorized entry. Pros: Comfort features, reasonable price. Cons: Fuel efficiency, safety features.